The Central Park Pilgrim is one of the most-loved statues in the Park. Since 1885, he’s watched over picnics, proposals, and sled races from his perch amid the cherry trees on top of Pilgrim Hill. On the occasion of the New England Society's 75th year, the association commissioned the statue to honor the early colonists. The pilgrim grasps the muzzle of a flintlock musket in his right hand. The pedestal comprises four bas-reliefs depicting Crossbow and Arrows, the ship Mayflower, Commerce, and Bible and Sword. The inscription on the pedestal reads "To commemorate the Landing of the Pilgrim Fathers on Plymouth Rock: December 21, 1620." 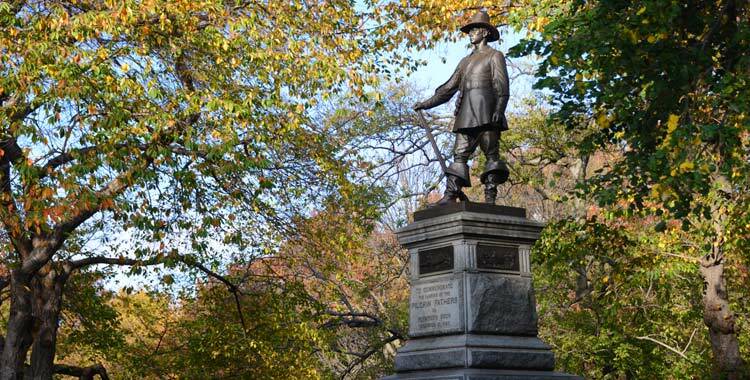 The statue stands at the bottom of Pilgrim Hill, Central Park's favorite sledding area. The monument was given a comprehensive conservation treatment in 1979, under the auspices of the Central Park Administrator's Office. In 2015, the Conservancy performed conservation work on the statue, using lasers to remove the old protective coating. We steam cleaned the monument, applied a new wax coating, and restored several bandolier straps that had gone missing over the years. East Side between 72nd and 73rd Streets on Pilgrim Hill.